Our tree is officially up and decorated to it's full potential! I can't stress enough how much I love the holidays. Now that Arianna is one, I think this Christmas might be harder than last (although I do hope not), and I think I've already shared my thoughts on this before. It's just, last Christmas, she was a teeny tiny baby, sleeping all the time. Now she'll be walking, laughing, talking, opening her own gifts. The holidays are still beautiful to me, but just the thought of not being able to see her face light up as she looks into the colored lights on the tree and points to them and smiles makes my heart break in two. 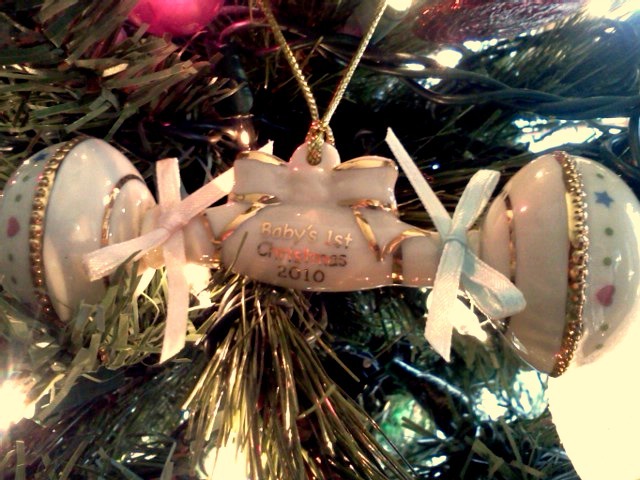 Last year, one of my gifts was a glass baby rattle, that read 'Baby's First Christmas 2010.' I put it on the tree on Christmas day, and then when we took the tree down, I put it in her keepsake box with all of her things from the hospital. This year, I took it out and hung it on the tree again. I think I'll start a new tradition this year. I'll hang it up on my tree every year, in honor of her. I thought about maybe getting an ornament every year for her but hanging it on my own tree as a way to celebrate *with* her, but I think I like this idea better.